At WalletPop, we believe everyone should be well-versed in all things money. We want everyone to know how to balance their checkbook, how to create (and stick!) to a monthly budget and how to save on groceries. We encourage all consumers to improve their credit scores and dig out of damaging debt. And there's certainly a lot to know about taxes and insurance and ... OK, we admit, as important as these personal finance issues are, some money topics can fall short on the scintillating scale. So today, we offer you something from the lighter side of money: mini money facts from the tops of bottle caps -- of all places. 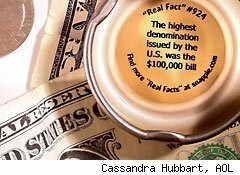 Real Fact #924: The highest denomination issued by the U.S. was the $100,000 bill. WalletPop Says: The $100,000 bill features Woodrow Wilson and was issued in 1934 in small quantities. However, these Gold Certificate notes were used only for official transactions between Federal Reserve banks and were not circulated among the general public. Real Fact # 804: There are 293 ways to make change for a dollar. WalletPop Says: With this many ways to make change for a buck there's bound to be some change rolling around in your pocket at the end of the day. Grab yourself an old jar and start filling it up with those loose coins; you'll be surprised how quickly spare change adds up. Real Fact #707: Most rechargeable batteries can be recharged up to 1,000 times. WalletPop Says: If you use rechargeable batteries, instead of buying a new 4-pack every time you needed to power up your kid's remote control car, you could save a bundle. For more ways to make the most out of your battery bucks, check out our Savings Experiment on the subject. Real Fact #710: A tankless water heater uses half the energy of a standard model. WalletPop Says: When you look for new appliances be sure to investigate differences in energy efficiency as well as the features that each one represents. You may be able to save on energy costs by spending a little more up front. Real Fact #700: Turning off the faucet while brushing your teeth can save up to 5 gallons of water. WalletPop Says: If you always leave the water on while brushing you're not only wasting water, but adding to your monthly water bill. Real Fact #921: If you had one billion dollars and spent one thousand dollars a day, it would take you 2,749 years to spend it all. WalletPop Says: It's hard to believe that it could take that long to spend one billion dollars, but when you compare that to how quickly many lottery winners spend their windfalls it seems like forever. Take for example, this guy who blew $14 million in prize money in only 8 years. Real Fact #851: Miami installed the first ATM for roller bladers. WalletPop Says: While convenient, ATM fees can quickly deplete your checking account in $20 increments. If you must use an ATM frequently find one owned by your bank or look for a bank which refunds the first ten ATM fees every month. Real Fact #882: In 1859, 24 rabbits were released in Australia. Within 6 years the population grew to 2 million. Just like the rabbit population, your savings can also grow quickly. You can make sure you're getting the best savings rate available by checking out sites like Money-Rates.com. Or use WalletPop's savings calculators to see how your savings can grow. WalletPop Says: It's easy to get caught up in taking gambles to get ahead, but make sure you don't lose your china (and more) in a get-rich-quick scheme. They never end well. If you need to make some fast cash, and don't want to lose your shirt, check out these 25 unusual ideas for making quick money. Real Fact #776: Ferret comes from the Latin word for "little thief." WalletPop Says: Ferrets earned this nickname due to the fact that they like to "ferret" away or steal small items. How many ferrets are sucking away at your checking account every month? Are you letting ATM fees, overdrafts, old subscription services bleed you dry? Here are 10 annoying money-stealers we wish we could cage.